But that’s certainly not her view. In fact, she’s adamant that religion must be at the table in foreign policy discussions. “There are some who might want to engage in such a bridge-building effort without bringing religion into the conversation — to them I say, ‘Good luck,'” she added. “That had nothing controversial in it,” she told the crowd, laughing. 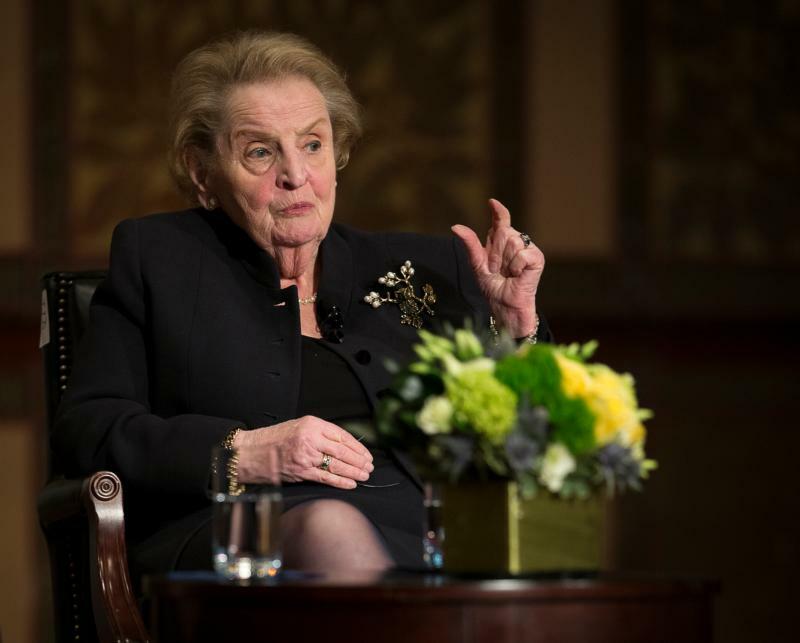 Albright, who was born in 1937 in Prague, said the book was not something she ever thought she would write but it came from seeing religion not getting the place it deserved in policy discussions. The concept, she noted, is particularly hard for Americans to accept “because we believe so deeply in the separation of church and state.” She said efforts to have religion be part of policy talks must be taken up but it has to be done carefully to avoid creating new problems. People tend to have a narrow view of religion, she said, not forgetting it as much as compartmentalizing it, keeping it personal and local. She understands how religion can “serve as source of inspiration and healing” and she also knows the flip side: how it is “easy to blame religion, or what people do in the name of religion,” for the troubles in today’s world. “But that’s too simple,” she added. The former secretary of state, awarded the Presidential Medal of Freedom in 2012, said terrorists want to divide the modern world. “We need to remember we were not attacked on September 11 by the Muslim world; we were attacked by followers of a perverse ideology that uses Islam to justify terrorism,” she said.